People like to be scared -- that's why there are roller coasters -- and a lot of people live their lives scared of just about everything, no matter how irrational. Take Lyme Disease. This is a very-hard-to-get and very-easy-to-cure disease, as the article below makes clear, yet there is no end to the fear people express. You are going into the woods? You are spending a day in the field? In fact, not only is Lyme Disease hard to get, it is easy to treat and generally, even if your dog catches it, it will be asymptomatic. How easy is Lyme Disease to treat? Consider this: doxycycline, which is the universal treatment for Lyme, is available without a prescription. Just order the Bird-Biotic version from Amazon or Revival Animal Health (100 capsules of 100 mg doxyclines will be less than $30) for a quick prophylactic dose if you are really worried after finding a tick on yourself, or a curative dose if you or your dog comes down with symptoms. If you want to spend money and time with doctors and vets, knock yourself out, but in this case there may be a better use for these two precious resources. Another point: Never get your dog tested for Lyme disease. The tests are entirely worthless, racking up more false positives than true positives, and suggesting expensive treatment even in asymptomatic animals. Also, never get your dog vaccinated for Lyme disease; this too is another veterinary scam. Remember, Lyme disease in dogs is rare, it is never fatal, and it is easily treatable. If you veterinarian insists on a Lyme disease test because your dog is limping, he or she is either incompetent, or billing you for an medically unnecessary procedure (or both). Remember the Lyme disease tests are worthless; the huge number of false positives here mean that you are paying for nothing. If Lyme disease is suspected in a limping dog, the proper protocol is to dose the dog with doxycycline ( 5 mg per pound of dog, twice a day). If the dog gets better after a few days, keep it on a daily regime for 5 weeks and everything will be fine. Lyme disease is very difficult to catch, even from a deer tick in a Lyme-infested area, and can easily be stopped in its tracks with a single dose of an antibiotic, a new study shows. And two other studies conclude that prolonged and intensive treatment with antibiotics, a course of care advocated by a small group of doctors, does nothing for people with symptoms often attributed to chronic Lyme disease. These findings are in keeping with the assertions of researchers who say that in most cases, such symptoms have nothing at all to do with the disorder. The three studies, scheduled to be published on July 12 in The New England Journal of Medicine, were released yesterday because the journal's editors thought they were so important, with the onset of summer and the accompanying fear of Lyme disease. "This is reassuring information for people who make decisions based on evidence," said Dr. Jeffrey M. Drazen, the journal's editor in chief. Researchers, both those associated with the studies and others who were not, said they hoped the findings would ease what they called inflated public fear of Lyme disease, which is widely perceived as a grave illness that is easy to catch. A total of 16,019 cases were reported to the Centers for Disease Control and Prevention in 1999; 92 percent of those cases were in nine states, most of which are in the Northeast, including New York and Connecticut. Dr. Leonard H. Sigal, a Lyme disease expert at the University of Medicine and Dentistry of New Jersey-Robert Wood Johnson Medical Center in New Brunswick, who was not associated with the studies, said the message from them was that "Lyme disease, although a problem, is not nearly as big a problem as most people think." "The bigger epidemic," Dr. Sigal said, "is Lyme anxiety." The study to see whether a single dose of the antibiotic doxycycline could prevent Lyme disease was directed by Dr. Robert B. Nadelman, a professor of medicine at New York Medical College and attending physician at the Westchester Medical Center, both in Valhalla, N.Y. Dr. Nadelman said many doctors, in hopes of heading off Lyme disease infection, had been giving 10-to-21- day courses of the antibiotic to people who had found deer ticks on their bodies. "They would be treating people as if they actually had the disease," he said. He and his colleagues wondered whether one dose would be enough. They recruited 482 people in Westchester County, N.Y., where the incidence of Lyme disease is among the highest in the world. All had found deer ticks on their bodies. (The insects were identified by entomologists.) Half got a single dose of doxycycline, taken in the form of two capsules, and the others got two dummy capsules. The investigators found that the drug did prevent Lyme disease: just one person, 0.4 percent of those who took it, came down with the illness. But even among those who took the placebo, the chances of getting the disease was just 3 percent. Dr. Eugene Shapiro of Yale University School of Medicine, who wrote an accompanying editorial, noted that the antibiotic often caused nausea, vomiting and abdominal pain and that among those who took it, there would have been very little chance of getting Lyme disease in any case. People who are bitten can watch the site where the tick fed, Dr. Shapiro said, and if they develop a rash within a few weeks, they can take a full course of antibiotics. "Give that person 10 to 21 days of antibiotics," he said, "and they will be fine." Dr. Sigal agreed. He added that deer ticks crawl around the body for hours before settling down to feed, and during that time are easily washed off with a washcloth. And, he said, "even if you get the disease, it is easily treatable and it is curable." But Dr. Jesse L. Goodman, a Lyme disease expert at the University of Minnesota, said some people were so horrified by the possibility of getting Lyme disease that even a 3 percent risk was too much for them. "As a physician, I could respect that," Dr. Goodman said, adding that he would offer those people doxycycline. Lyme disease researchers emphasized, however, that previous studies had shown that most people with the infection get better on their own, without antibiotics. And while a small percentage develop serious symptoms, like arthritis or heart disorders, even the vast majority of these get better, the researchers said. Dr. Raymond Dattwyler, director of the Lyme Disease Center at the State University of New York at Stony Brook, said the typical Lyme disease patient has a rash but no other symptoms, takes an antibiotic and is cured. The two other studies released yesterday, financed by the National Institutes of Health, addressed the question of how to treat people who had Lyme disease and later developed symptoms like fatigue, aches and pains, and memory loss. Both were conducted by Dr. Mark S. Klempner of Boston University School of Medicine and his colleagues. One study enrolled patients who had antibodies to the Lyme disease microorganism, Borrelia burgdorferi, an indicator that they had been infected. The other enrolled patients who no longer had antibodies but had had a documented case of Lyme disease. Half the patients in both studies received an intravenous antibiotic, ceftriaxone, for a month, followed by oral doxycycline for 60 days; the others received dummy medications. The question was, Would this intensive antibiotic treatment make the patients better? The studies were meant to enroll 260 patients, but they ended early, after enrolling just 129 patients, because an independent committee overseeing them said it had become clear that the antibiotics were no more effective than the placebos. Dr. Shapiro said he was not surprised. Although a small group of doctors and patients insist that symptoms like fatigue and memory loss after a bout with Lyme disease are due to chronic infection with the disease organism, those symptoms are very common among the general public, leading Dr. Shapiro and others to believe there is some other cause. "Whatever is going on with these patients," he said, "if it is unresponsive to antibiotics, it is unlikely that it is untreated Lyme disease." In contrast, antibiotics have been shown to work extraordinarily well when, for instance, the Lyme organism has demonstrably infected the brain, Dr. Dattwyler said. But some who have treated hundreds of patients with long-term antibiotics, like Dr. Sam L. Donta of Boston University Medical Center, were not convinced. The antibiotics in the studies were not given for a long enough time, Dr. Donta said, and he would have chosen different ones. Perhaps all that the studies show, he said, is "that this particular treatment doesn't work." Dr. Brian Fallon, an associate professor of psychiatry at Columbia University, is directing another study of chronic Lyme disease that focuses on patients who have problems with fatigue, their memory and their ability to think. In his study, also supported by the National Institutes of Health, the patients receive intravenous antibiotics for 10 weeks, or a placebo. Dr. Fallon said he saw many such patients in his private practice and would continue to refer them to colleagues for long-term treatment with intravenous antibiotics. Dr. Sigal said, however, that in addition to the expense of long-term intravenous antibiotics - and some patients end up taking them for years - the drugs are dangerous. Some patients have died of infections caused by the catheters in their bodies, and others have experienced side effects from the drugs, including destruction of bone marrow, requiring a bone marrow transplant. "These are not benign drugs - they're all poisons," Dr. Sigal said. When they are needed to fight an infection, their risks, of course, are outweighed by their benefits. But when there are no benefits, he added, the risks are naturally unacceptable. Actually, everything you have written here is COMPLETE NONSENSE, and that is reinforced by the fact that you chose to be "Anonymous." There is NO Lyme disease test that is worth the price, because the cure is cheaper than the test. Take a test .. and then another test .. and then treat? Absurd. Lyme disease is NOT common, and if it were America would be full of lame dogs, which is it most assuredly is NOT. Most vet practices will go a year or two without seeing a single case of Lyme, and the disease is so rare in dogs that it likely has been around since the beginning of time and has simply been overlooked because it is quite rare in dogs and most dogs get better on their own. And, for the record, I live and hunt in the CENTER of Lyme activity in the U.S. and have my dogs out in the field every week (and without Frontline or anything else, thank you very much). No problem. Lyme is NOT hard to treat in dogs as anyone who has treated a dog will vouch. To suggest otherwise is NONSENSE. You suggestion that capsules are "problematic" is more nonsense, as is your note that Doxycyline is "extremely hard on the GI tract". Nonsense. Not only is Doxycycline not hard on the GI tract, and it is THE cure for Lyme disease given by EVERY veterinarian in the country. Put a capsule in a lump of cheese, and the dog will swallow it before it bounces once on the kitchen floor. 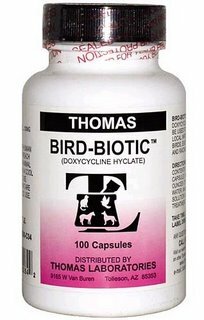 And, as I noted, you do NOT need to go to a veterinarian for a prescription for doxycyline -- order the avian stuff, and you are good to go. Call around to vet schools and they will tell you they have NEVER even seen a case of "Lyme nephritis" which is less of a true disease than a causal guess as to why a dog might have developed a case of nephritis (which is just a 10 dollar word for an inflamed kidney). In fact, there is NO evidence that Lyme disease has EVER caused nephritis. None. As to your final suggestion that there are a lot of serious tick-borne canine diseases, I call bullsh*t on that too. Not true, and if it were, thousands of American dogs would be coming up dead every week as this country is packed with ticks from border to border, and from sea to shining sea. As to Babesia, this is another side-train and complete nonsense. Lyme presents as a limp, Babesia generally presents NOT AT ALL (the dog has no symptoms and the protozoa is ususually overcome by the dog on its own), but will otherwise appear anemic or lethargic, not with a limp. There is NO good test for Babesia, and if the dog is asymptomatic the proper procedure is to do NOTHING as the one drug used to treat this rarely-a-problem disease has HUGE side effects. Sorry, but I "call bullsh*t" on all your points. What you have given is bad advice and is generalized uninformed fear-mongering. Your veterinarian must be making a fortune off you, or else you are a vet making a fortune off your gullible customers. Either way, I understand the desire to remain "Anonymous." Jeff Hays off topic but did you try the minocycline... if so any feedback appreciated.